China said Thursday it welcomed the establishment of ties with Costa Rica, saying it paved the way for "beneficial cooperation" and urged other allies of Taiwan in Latin America to end their relationships with the island. Since splitting amid civil war in 1949, Taiwan and China have fought to win the diplomatic allegiance of countries around the world. China refuses to have diplomatic ties with nations that recognize Taiwan, which Beijing regards as a renegade province it plans to eventually unify with the mainland. "The establishment of diplomatic ties is in the interest of the two countries and people. It has paved the way for friendly and beneficial cooperation between the two sides," Chinese Foreign Ministry spokeswoman Jiang Yu said at a regular news conference. Central America has been a bulwark of support for Taiwan, which is recognized by only 24 states. It has expressed fears that if Costa Rica were to shift its recognition to Beijing, other nations like Nicaragua and Panama would soon follow suit. 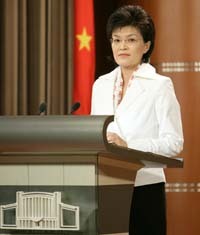 Yu said Taiwan was the "sole obstacle" confronting those countries. "We hope the relevant countries can follow the trend of the times and make the right choice."